Despite repeated delays of Samsung's flexible AMOLED displays, the Korean manufacturer treated the web to another demo video of what the wobbly screens can do. The new LEDs are made from plastic instead of glass, making them transparent and nearly indestructible. The plastic-based tech allows the screens to be super thin, light and flexible enough to bend, roll and fold without breakage. The new video looks like the open sequence of a sci-fi film. It shows the paper-thin touchscreens replacing newspapers, credit cards and watches. They're also mounted on refrigerators, walls and cars. One eye-catching scene shows a tablet that's a screen attached to a pen. The new footage is pretty exciting, but this hasn't been the first time Samsung has hyped its flexible screens -it's been showing the panels off for about a year. 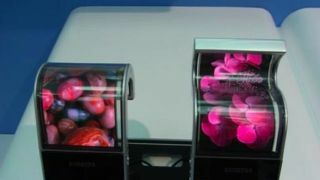 The Korean company premiered the first demo video last December, at which time Samsung pledged these twistable LEDs would roll out sometime in 2012. But the year only brought production setbacks. In September, we heard reports that Samsung ran into "problems with the yield" of the displays. And just a few weeks ago, Korean news sites indicated there were further delays. The reports indicated that Samsung needed to back burn production of the AMOLED to respond to increasing demand for glass units for the Galaxy S3 and Galaxy Note 2. Later predictions said the wobbly technology would start appearing in products during the middle of 2013, but that's only if Samsung can sort out production problems by the end of this year. With all the setbacks Samsung been a little shy about any further forecasts of when the new AMOLED panels will start creeping their way into the market. Even if the displays start rolling out in 2013, it should be a few years before the technology is as ubiquitous as Samsung's dream-like demo.